The Consumer Electronic Show is the biggest tech convention in the world. Held in Las Vegas and occupying nearly 2.5 million square feet of convention space, CES is known for introducing things like the thinnest televisions, self-driving cars, and of course, educational tech. It welcomed nearly 180,000 attendees and more than 4,000 exhibitors, all experiencing and showing off the technology of the future. This year, the most interesting aspect had to be the upcoming advancements in educational resources, and what I saw was nothing short of amazing. Here’s a look at some of my favorite new educational tech advancements. LEGO is the industry standard for education and robotics, with products including LEGO Mindstorms and LEGO WeDo. This year they’ve outdone themselves, creating a brand new kit called LEGO Boost. With the help of an app containing over 60 different activities, children can move blocks of code into place to make their robotic creation do as they wish. The app works on any tablet with Bluetooth so there’s no need to plug in the robot to update it with new commands. The starter kit comes with interactive motors and distance, color, and tilt sensors. With these pieces, students can build Vernie the robot with whom they can actually interact and play games. It also comes with instructions to build a guitar, cat, and more! 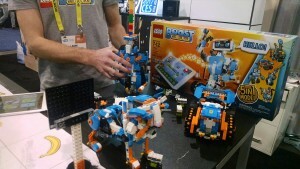 LEGO Boost teaches children how to make a robot move, wave, have emotions, and more. Its interactive app is designed to keep students captivated and creating. A beginner starts out by building the head, then learning to code as they piece together the rest of the robot. This step-by-step process leaves little room for frustration and keeps students engaged because they’ll play games with their robot instead of just watching it move. The presence of drones at this year’s show was unprecedented; you couldn’t go ten feet without seeing one! ROBOLINK stood out from the crowd with their build-it-yourself programmable drone. 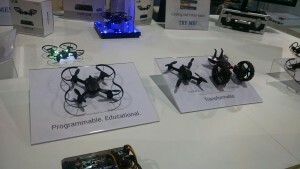 The kit is Arduino-compatible and includes everything your child needs to assemble a drone (one with awesome eyes!) like a controller, an inventor board, and more. Because it’s so modular it’s very durable, and you can get additional parts such as cameras, wheels, and even treads to turn it into a tank. Once the drone and controller are put together, students learn how to program the drone through free coding lessons provided by ROBOLINK. They teach aspiring coders how to make their drone do flips, take off and land, follow them around, and even fight other drones. Students learn to code their drone with drag-and-drop coding blocks, similar to how Scratch works. As they program their drone, they’ll learn about variables, loops, and more—all foundational programming concepts. How cool would it be to be able to physically draw a functioning electrical circuit with pen and paper? 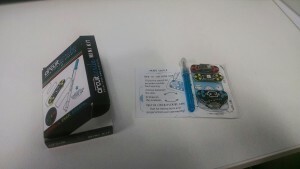 Circuit Scribe allows students to do just that with special conductive ink that draws connections between modular magnetic pieces. Here’s how it works: aspiring electrical engineers take a sheet of paper and determine where they want to place the power source (typically a battery module). They then draw a line to where they want to place their next module (such as a different colored LEDs). After they’ve drawn their connections, they slide a magnet under the paper and then drop the modules on, linking them all together. With this power, students can create custom works of electrical art — imagine a drawing of your house that lights up! You can purchase varying levels of kits for your budding engineer that all come with the conductive pens, a ton of modules, and workbooks for putting them together. You can even grab single pieces from their website such as motors, fans, and light-dimming switches. The workbooks available demonstrate how the the modules can be connected together; this helps students learn what it takes to make a complete working circuit. Since they’re drawing the connections themselves, it helps students understand how the different parts interact with each other. By allowing children the creative freedom to place modules and connections anywhere, they become more invested in what they’re making because it’s unique to them. CES is a great way to check out what’s coming up in the future of tech. It’s also one of many ways iD Tech stays up-to-date with our course offerings. Be sure to check out our beginner to advanced Robotics and Engineering courses, especially our newest addition to iD Tech Mini—MakerStation Invention Lab for ages 6–7 and 8–9.